This section explains how TMJ affects the spine structure and the nervous system. Subsequently, explanation of how FCST is unique in treating TMJ to other treatments available is provided. Movement of the TMJ is very closely related to the second cervical vertebra, C2 or also known as Axis. One might think that when the mandible opens and closes, its movement is centered around the condyle in the TMJ itself. However, this is not the case. 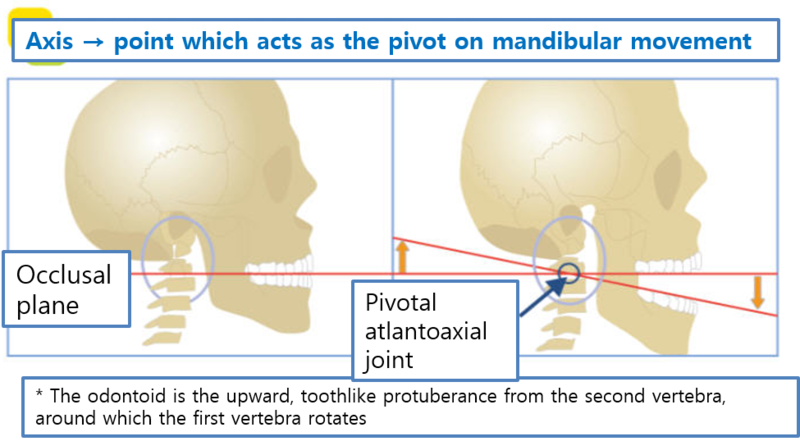 According to the Quadrant Theorem of Guzay, the axis of rotation of the mandible lies exactly at the odontoid of C2. (The odontoid is the upward, toothlike protuberance from the second vertebra, around which the first vertebra rotates.) When the mandible moves downwards, this generates a pulling force, loosening the muscles around C2. Likewise, when moving up (i.e., when closing the mouth), it generates a pressure, which tightens the muscles around C2. This means that in an occlusion with decreased vertical dimension will aggravate muscle tension around C2 when the mouth is closed. Therefore, it is clear that distortion in TMJ will affect the position of the Axis too. Of all 24 vertebrae in the spine (7 cervical, 12 thoracic, 5 lumbar), there is only one vertebra with an odontoid/axis, which is C2. 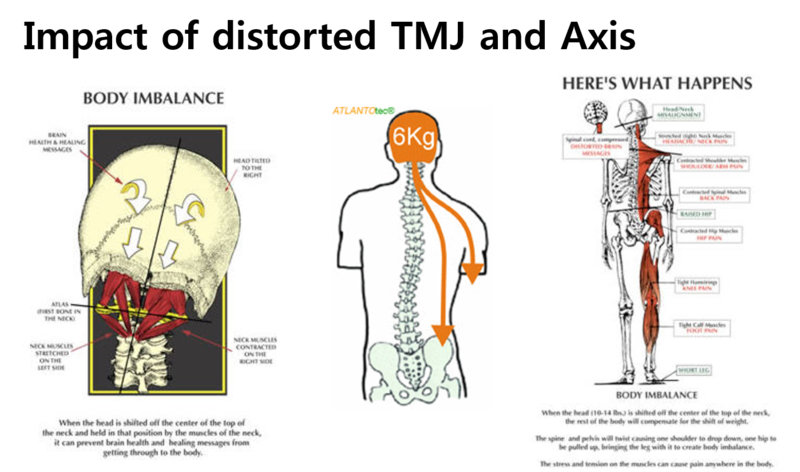 Therefore, the Axis plays a key role in the balance of the entire spine. Together with the TMJ, C2 is the most significant variable affecting the entire spine structure. So what happens next after subluxation of Axis? The rest of the spine collapses like in the domino effect even affecting position of the cranial bones and pelvis. This is explained by Lovetts reactor relationship. Source : Neurosomatic Educators INC. According to Lovett Reactor relationship, each vertebra is coupled in motion with another vertebra and the pelvis is coupled in motion to the cranium. C1 + L5, C2 + L4 and C3 + L5 automatically move in the same direction (also known as coupling movement). The other vertebrae pairs, for example C4 + L2 move in the opposite direction. 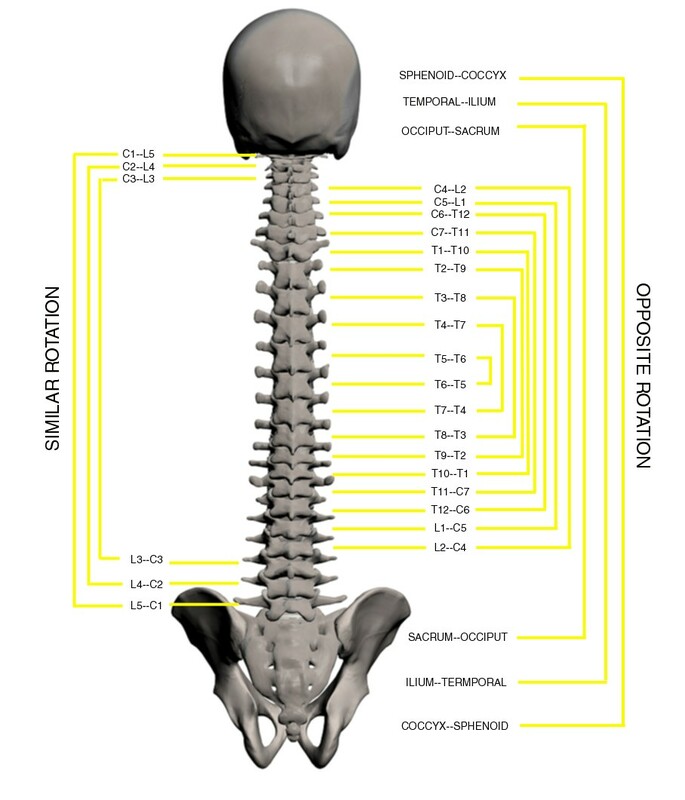 Therefore, impact on one vertebra influences other vertebrae in the spine. 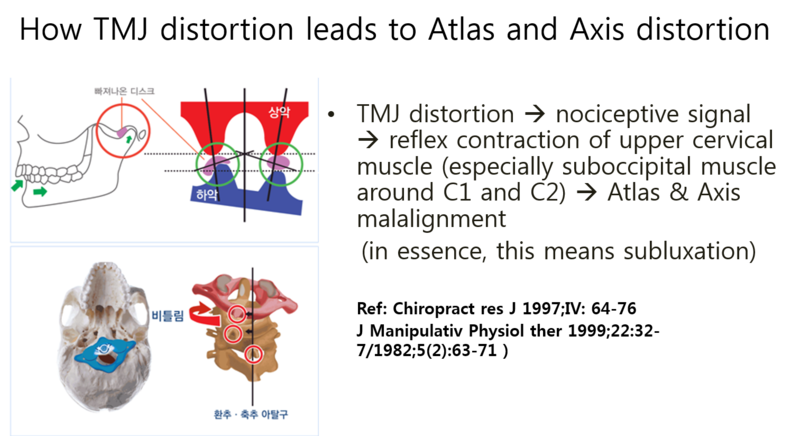 Therefore, TMJ distortion causes subluxation of C2 (Axis) which leads to the collapse of the rest of the body structure. Nine of the 12 cranial nerves are found near the temporal bones from which the mandible is suspended. 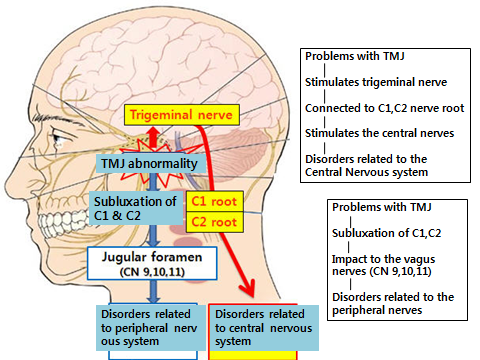 Particularly, the 5th cranial nerve (also known as trigeminal nerve) innervates the TMJ and are coupled to C1 and C2 (Atlas and Axis). The cranial nerves together control 136 different muscles (or 68 pairs of “dental muscles”) connecting the entire spine. According to Dr Lee, misalignment of TMJ disturbs the trigeminal nerve and it can lead to problems in the rest of the nervous system. Problems in the nervous system may cause abnormal muscle contractions and pain due to central sensitization and wider range of brain plasticity. 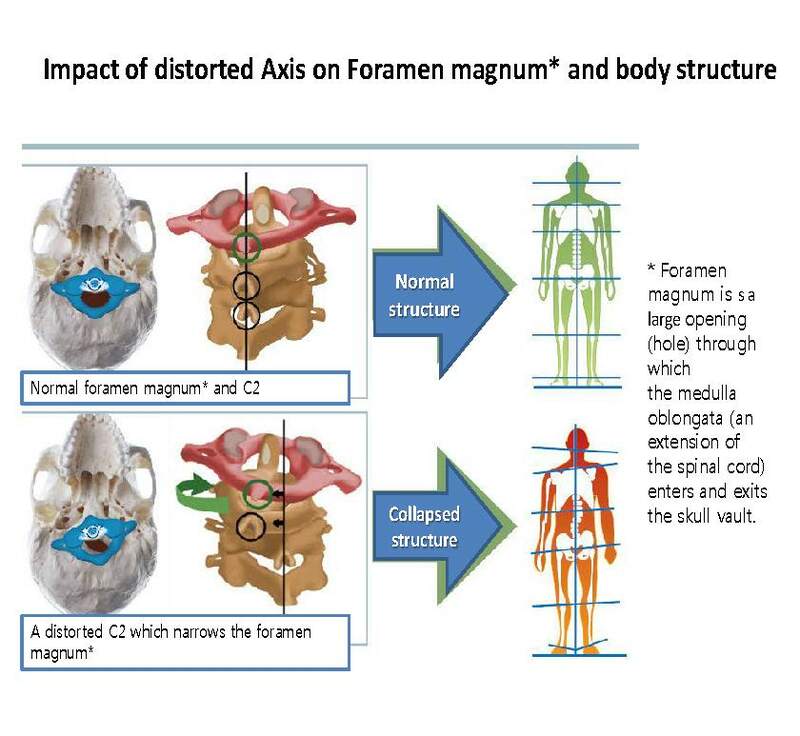 Not only this, TMJ distortion which causes subluxation of C1 and C2 can limit the space of foramen magnum (which is an opening at the base of the skull) through which the cerebrospinal fluid circulates. This can negatively impact the body-brain communication and also cause restriction of the jugular foramen, another opening in the base of the skull transmitting veins, arteries, and nerves. Restriction in these openings can mean less efficient brain respiration due to decrease in the cerebrospinal fluid circulation and can also limit proper flow of blood to the brain. In conclusion, TMJ is the most important factor which contributes to collapse of spine structure and disruption of the nervous system. 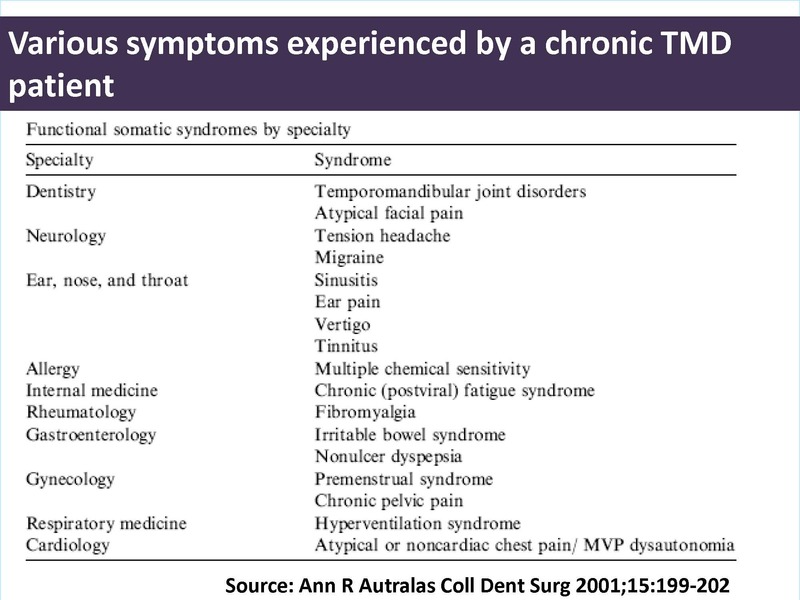 iii) What causes TMJ imbalance? When patients first experience TMJ problems, they may feel pain around the jaw area, develop headache or problems chewing. However, once TMD becomes chronic the symptoms are not only concentrated on the facial area but patients start suffering variety of symptoms including pains going down to the neck and back and psychological disorders such as depression and anxiety. It can be said that TMJ is the only joint in our body which causes such different symptoms between acute and chronic patients. Usually, for other joint related illnesses, the symptoms do not involve much more than pains around the affected joint area. 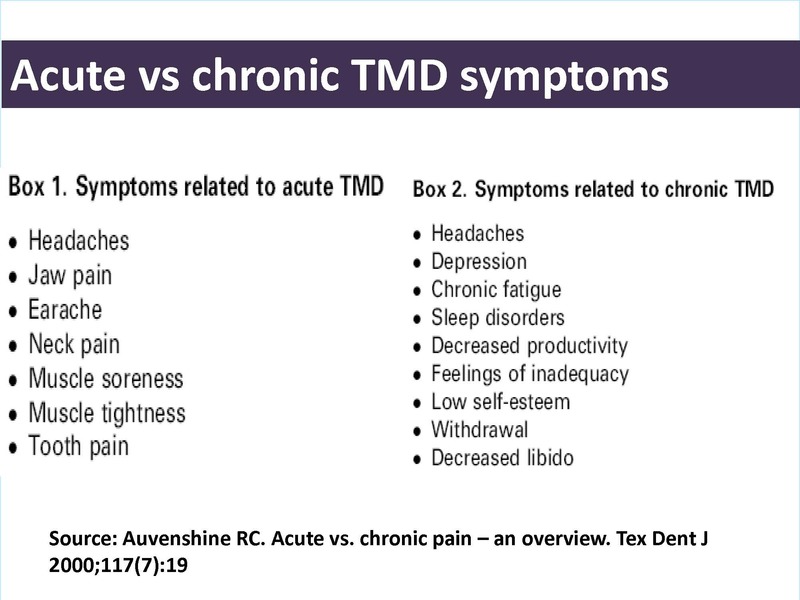 However, studies have found that many chronic TMD sufferers not only experience pains and depression but also indigestion, allergies, chronic fatigue, dry/soar eyes, eczema, difficulties in hearing, loss of coordination, numbness in the limbs and fingers, tinnitus, asthma, cold hands and feet, apnoea, vertigo and many others. 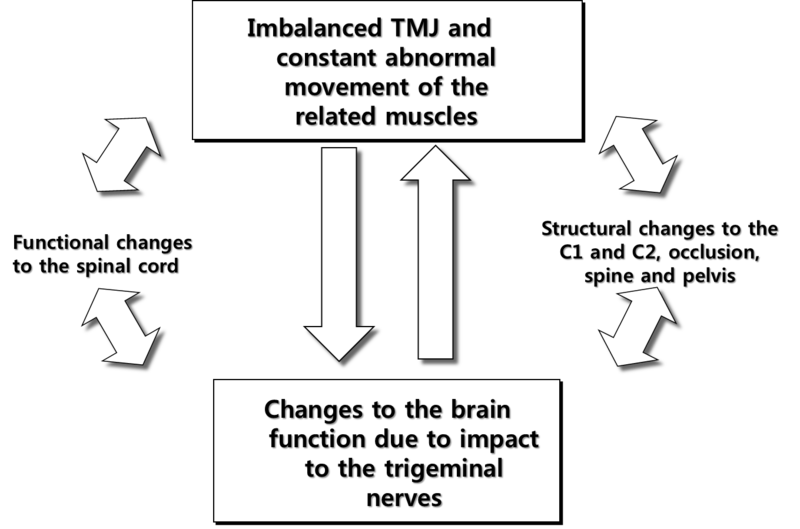 This can be explained by the impact TMJ imbalance has on the rest of our body structure and the nervous system as described above. iv) How can TMJ imbalance be resolved? There are various dental treatments, surgeries and other practices in both medical field and alternative medicine today but it may be very difficult to find treatments that are effective for all sufferers. So how is FCST different? Ultimately, this treatment aims to achieve the optimal balance (left, right, front and back) from top to bottom of our entire body. Once this optimal balance is achieved in the entire body and patients no longer experience Deflections it is viewed that patients do not require further treatment. A freeway space is the space that exists between the upper and lower articulatory members at rest. It is only when we swallow that the teeth make contact in order to create pressure. The space varies from 1-8 mm but most people tolerate a space in the 2-3 mm region. According to Dr Lee, even 1/10 of a mm defect in the freeway space can distort the TMJ (and therefore causing problems with the nervous system). A splint made of hard material, although custom made, does not allow flexibility when there are muscular and/or structural changes in the individuals as a result of wearing the device, making it difficult to settle at the precise freeway space. Therefore, his intraoral balancing appliances are designed to fix this flaw. During treatments he uses special thin sheets of paper for optimal balance (sometimes referred to as zero point).